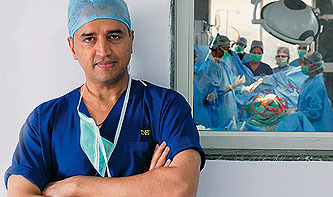 Dr. Shetty, who entered the limelight in the early 1990s as Mother Teresa’s cardiac surgeon, offers cutting-edge medical care in India at a fraction of what it costs elsewhere in the world. His flagship heart hospital charges $2,000, on average, for open-heart surgery, compared with hospitals in the U.S. that are paid between $20,000 and $100,000, depending on the complexity of the surgery. ….Then there are the Cayman Islands, where he plans to build and run a 2,000-bed general hospital an hour’s plane ride from Miami. Procedures, both elective and necessary, will be priced at least 50% lower than what they cost in the U.S., says Dr. Shetty, who hopes to draw Americans who are uninsured or need surgery their plans don’t cover. A few notes: Shetty runs a for-profit business, not a charity. He makes money at these prices. And although a big part of his lower prices has to do with the generally low cost of living in India, his mass-production techniques have reduced prices more than 50% even compared to other Indian hospitals. But although this may be cheap medicine, there’s nothing cheap about his results: outcomes at his hospitals are at least as good as they are at the best American clinics, and probably even better. It’s the kind of thing someone ought to be trying here. The whole story is worth a read.